How often do you feel guilty for working late? For not being there with your kid all the time? For buying cookies outside instead of baking them yourself? For meeting the standards set by your own mother and mother-in-law? The list just goes on and I have faced all of this and more in my day-to-day life. I am here to share some of the tips on how to get things straight based on my personal experiences. To begin with, the answer to all our problems is, Get Over It!. Whether you are a working mother or not, you are going to be criticised for how you bring up your kid. This blog is not about what you should be doing for your little one; it’s about how you do it. Just as it does in any other domain, communication plays a key role. It’s important to talk to your kids even at a very young age. They may or may not respond to you, but it does gets embedded in the subconscious mind and will be reflected when they are old enough. Some people might think you are crazy to do this but who cares? I just love talking to my baby. Here’s one incident which pops into my head as I say this. One day, when I got back home, I noticed my daughter playing with a pair of shoes. Being a typical mother, I rushed towards her, put her shoes aside and carried her to wash her hands and legs. After I finished, I made her sit on my lap and had a “grown-up” conversation on hygiene with her. What surprised me is that my little munchkin — who is just a year and four months — understood. And yes, she has stopped playing with her shoes. Now every time I lift them, even to put them away, she looks at me and says, “Yuck, Momma!”. Here’s good news for all the working mommies out there — research says that working mothers spend an equal amount of time with their kids as do stay-at-home mothers. Does it sound odd to you? Because it did to me when I first heard about it. So, here’s the theory behind it: though a mother stays at home and her child is with her 24x7, she devotes her one hundred percent concentration for only about 3-4 hours a day. Which is almost equal to what a working mother does. Sounds boring right? Trust me, it was to me as well. I was never the kind of girl who kept her room neat and tidy. My husband took on the responsibility and chipped in, but things just became harder after the birth of my daughter. Starting out as a mother, I would concentrate completely on her needs — sterilising her bottles seemed more important than folding blankets. As a result, my house was a mess. This is when my husband and I had a talk. I realised that getting organised is no rocket science and it is much easier when both partners work towards it consciously. The mantra is allotting time for each task. So, every night after I put my daughter to bed, I start off with clearing up. During the first few days, it would take me half an hour to get this done. But in a week, I was able do it in less than fifteen minutes. The feeling I get seeing things in place is amazing. Now, I wake up to a clean and tidy house — not to forget a happy husband — which gives me a great start for the day. Be it the workplace or managing your kids, it is important to keep to routines. This way your little one will also know what to expect which will help him or her to be more relaxed throughout the day. Here’s a piece of advice — never skip a day at work. Sounds unreasonable? Well, this is the best way to keep your stress levels down. 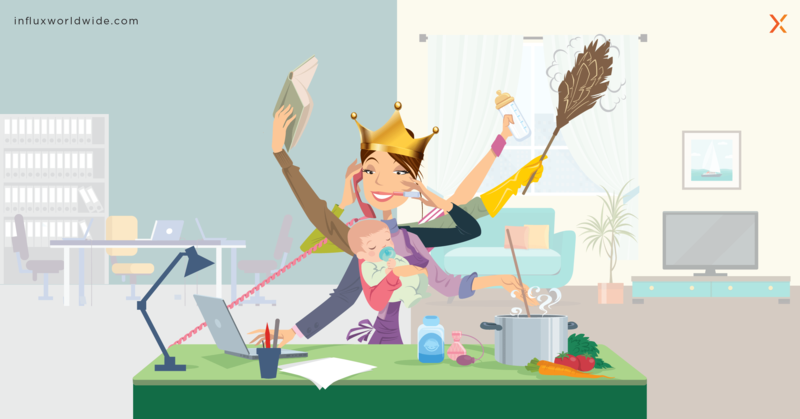 Skipping a day at work can disrupt the routine you have created for yourself and your child. Your kid could become used to your staying at home and might get fussier when you set off to work after a break. You too are likely to be stressed because of all the pending tasks that have piled up in office during the days you took off. So, next time, unless it is very important, never take a day-off. Confidence is the only weapon that is going to fight all odds. Be it a presentation at work or a different approach to teaching your kid, believe that you can do it. Have this encrypted in your head. This way you will be immune to any sort of criticism from your fellow team-mates or your well-meaning relatives and their ‘well-meant’ advice. Just remember that you are the best mom for your child and you’re are the best employee at your workplace.